…and delivered, in terms of pure action, perhaps the best Mission: Impossible installment to date. McQuarrie’s screenplay for M:I—Fallout (hereafter referred to as just Fallout), on the other hand, is a step down from his last one, and no action, however masterfully crafted, can distract from that. Two years have passed since Ethan Hunt (Tom Cruise) of the United States’ Impossible Missions Force (IMF) captured former British agent turned anarchic terrorist Solomon Lane (Sean Harris). The remnants of Lane’s group The Syndicate have reformed into The Apostles. Hunt and fellow IMF agents Benji Dunn (Simon Pegg) and Luther Stickell (Ving Rhames) fail to prevent The Apostles from obtaining three precious plutonium cores that their new client, the mysterious John Lark (????? ), could turn into three portable nuclear weapons. IMF Secretary Alan Hunley (Alec Baldwin) tasks Hunt to impersonate Lark, who has arranged to obtain the cores from The Apostles in Paris, with black market arms dealer Alanna Mitsopolis/White Widow (Vanessa Kirby) acting as broker. To ensure that Hunt does not fail, CIA Director Erica Sloane (Angela Bassett) dispatches Special Activities operative August Walker (Henry Cavill) to stick close to Hunt. Once Hunt meets the White Widow, she agrees to hand over all three cores in exchange for one favor: Hunt must break Solomon Lane free so that she can return him to The Apostles. Now if only British MI6 agent and past ally Ilsa Faust (Rebecca Ferguson) did not have orders to kill Lane at the same time. I mentioned in my Incredibles 2 review from earlier this year that I had begun to regard that animated film “less as a stellar follow-up and more like a stellar appendix” to its 2004 predecessor. In light of 2015’s Rogue Nation, I have a similar regard for Fallout. Nearly all of Rogue Nation consists of Hunt, his IMF colleagues, and newcomer Ilsa Faust reacting to a situation beyond their control and working tirelessly to prove their innocence against Solomon Lane’s treachery, with the audience right behind them throughout. Thanks to Christopher McQuarrie’s screenplay and direction, Rogue Nation harnessed its genuine and well-paced suspense and ferocious wit to earn its satisfying finale. Fallout, as a more direct sequel to Rogue Nation, starts with Hunt receiving his next mission as usual and failing it due to “good intentions”. He and his team must then resume the mission, improvising where needed, and all while cleaning up the mess with CIA’s star Agent Walker watching over their shoulders. In between Fallout’s spectacular action sequences, the twists blow minds and the handful of conflicting interests among the characters give off the appearance of a complex action spy thriller. Yet upon reflection, these plot elements, which come to a head during Fallout’s London bunker sequence, make writer-director McQuarrie’s second M:I contribution more muddled than necessary, bordering on implausibility. Furthermore, even the most casual viewer will never doubt the heroism of Tom Cruise as Ethan Hunt. This is Mission: Impossible, not Collateral, and ingredients like a plan to massacre French cops cannot simply get brushed aside. My first viewing of Fallout left me as excited as anyone else by its enthralling and relentless action. 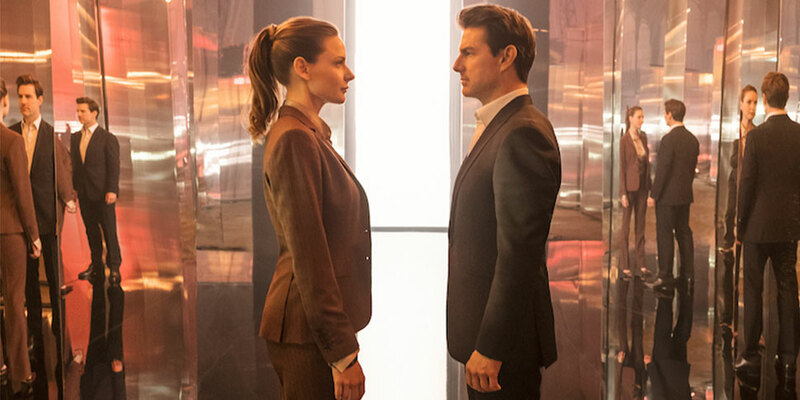 In that respect, Fallout is the best Mission: Impossible movie and Christopher McQuarrie embraces his deepest directorial instincts to reach creative heights yet unattained. Likewise, Tom Cruise continues to cement his action star legacy, even as he approaches 60. Upon leaving my re-watch, however, I could no longer shrug off Fallout’s confusing web of espionage double-crossings. Complexity has its place, but so does clarity. Rogue Nation had clarity and the wit to help its intricacies reach the minds of audiences, as did the first Mission: Impossible from 1996 and the fourth film Ghost Protocol from 2011. I wish that some of the clarity that so gorgeously marks Fallout’s exceptional action sequences had rubbed off on its plot. Still working on it? A bit too late for that. P.S. After all was said and done, keeping the mustache was worth it.